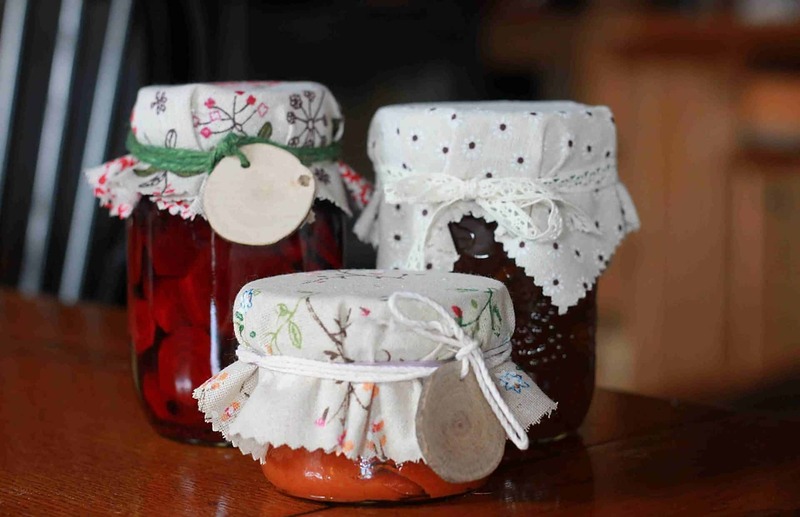 Fabric covers on home-made preserves bring an old world, European feeling to your creations. It’s especially nice to have a handful of specially adorned jars in the pantry for impromptu gift giving. 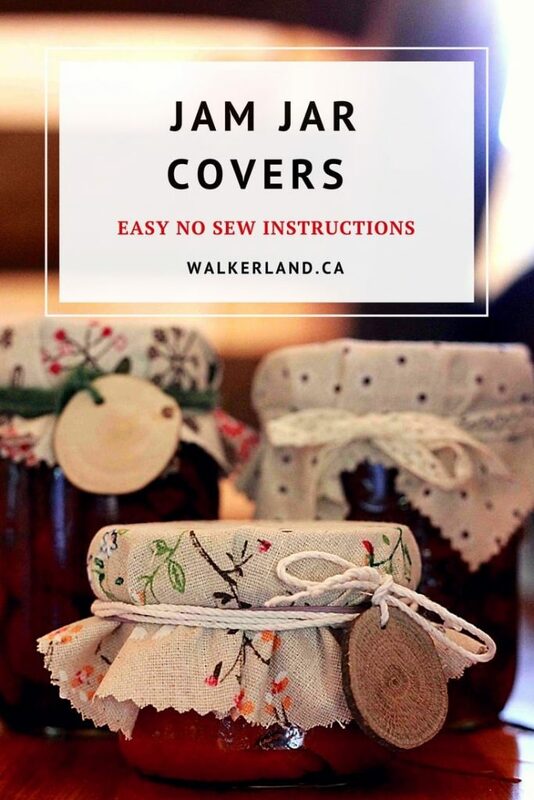 These beautiful covers are easy to make and require NO sewing skills. Create your own stand out gifts and market stand products with a few scraps of fabric and some twine. Fabric – Most types of fabric will work for this project. A heavier canvas material was used on the jars in these photographs. Cotton, burlap, lace and even old pillow cases, curtains or blouses all work well. Pinking shears – Pinking shears create a tidy zig zag edge. These scissors help to prevent the fabric edges from fraying. If you don’t have pinking shears just use regular scissors. Decorative ribbon/twine/elastic – Leave three inches on each end for tying off and then wrap the twine loosely around the jar to determine what length to cut. I might wrap two to three times depending on the effect I am trying to achieve. Once you have determined the desired length, measure and cut the rest of your twine or ribbon. Rubber bands (optional) – Rubber bands make it easier to secure the fabric in place and adjust the ruffles before you add the decorative twine or ribbon. I don’t always use elastic bands but they do make this project a bit easier. Tags – You will need a label or a tag for the jar to identify it’s contents. 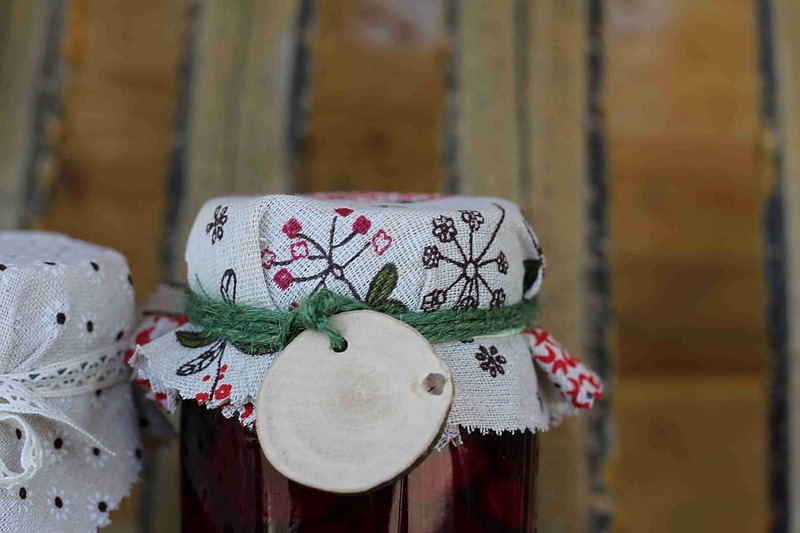 You can affix a sticky label to the jar itself or tie a tag onto the ribbon/twine. 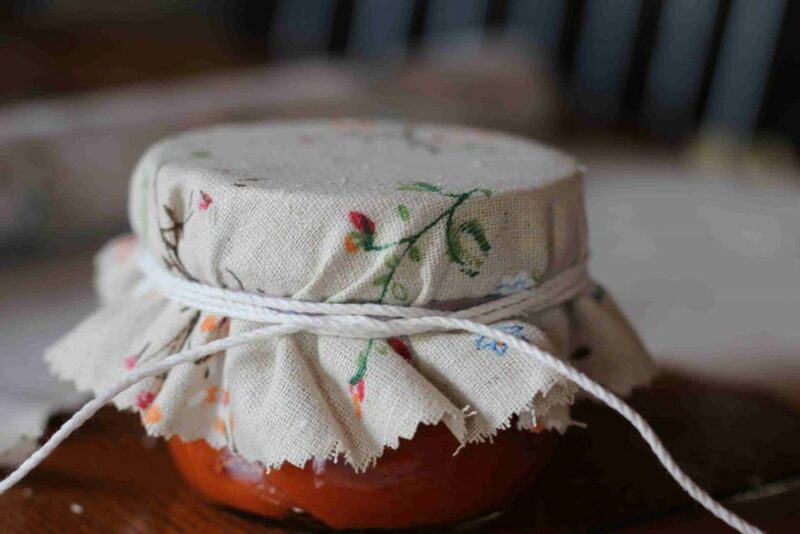 When using a tag, you might also want to place a sticker on the lid of the jar so the contents are still labelled when the fabric cover has been removed. 7″ Round or square template – Cut a template from cardboard or search for round lids or scrap wood that offer the dimensions 7″ dimensions that you are looking for. Circles create a tidy uniform ruffle around the jar. 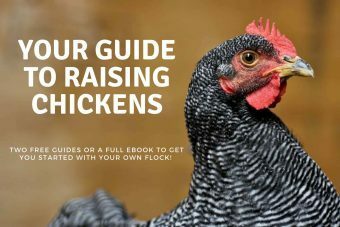 Squares offer a more uneven look. For most jars a 7″ x 7″ squares or 7 inch diameter circle will be ideal. This size works well for many regular and wide moth jars. 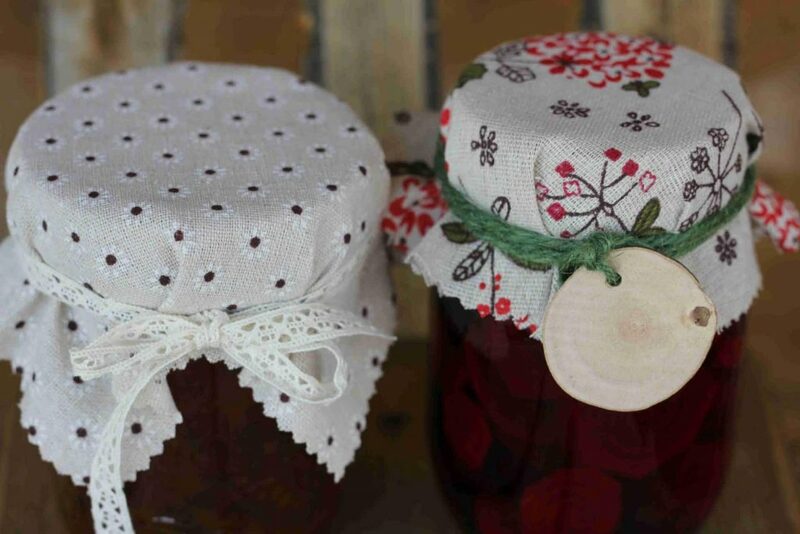 7″ Round jam jar covers provide a uniform ruffle around the jar. 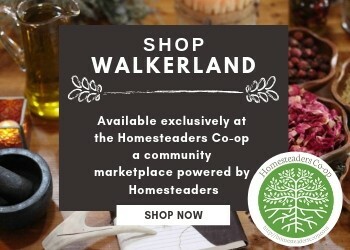 They fit most mason jars: regular and wide mouth styles as well as tall and short jars. 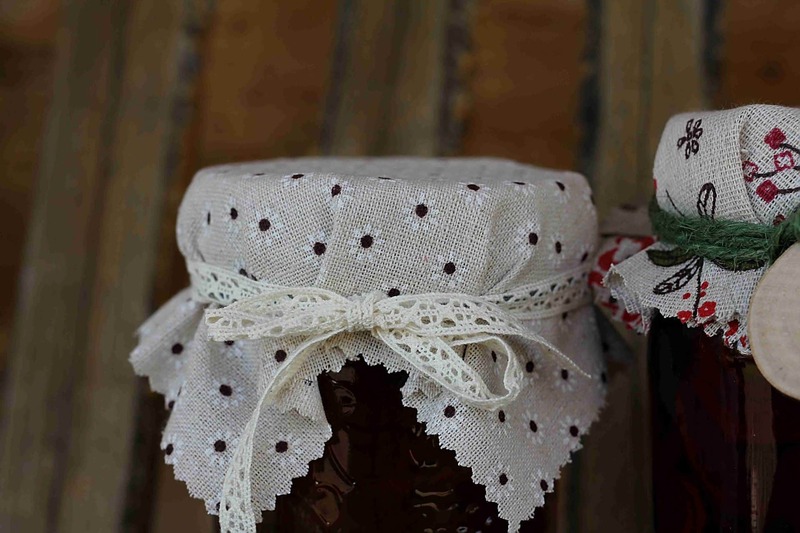 7″ Squares create an uneven jam jar cover. These work best on tall jars. The overhang on the sides can drown the shorter style of jars. 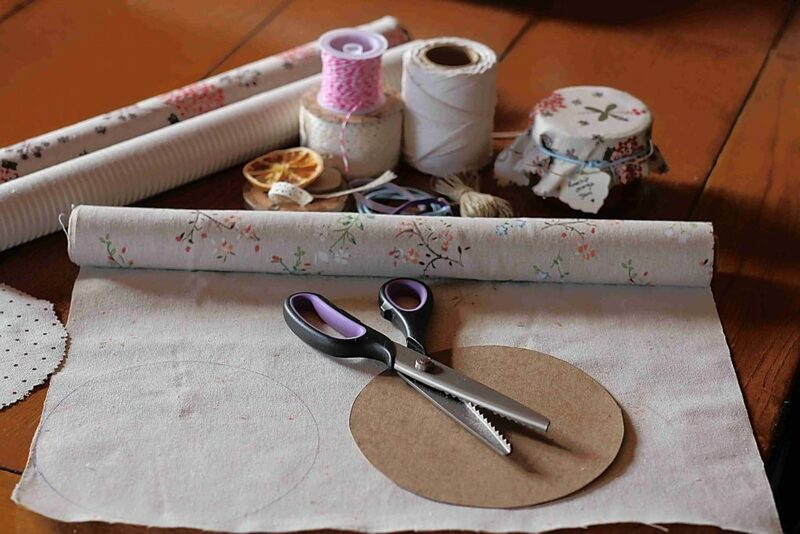 Measure and cut your fabric rounds or squares, your ribbon and grab a rubber band. 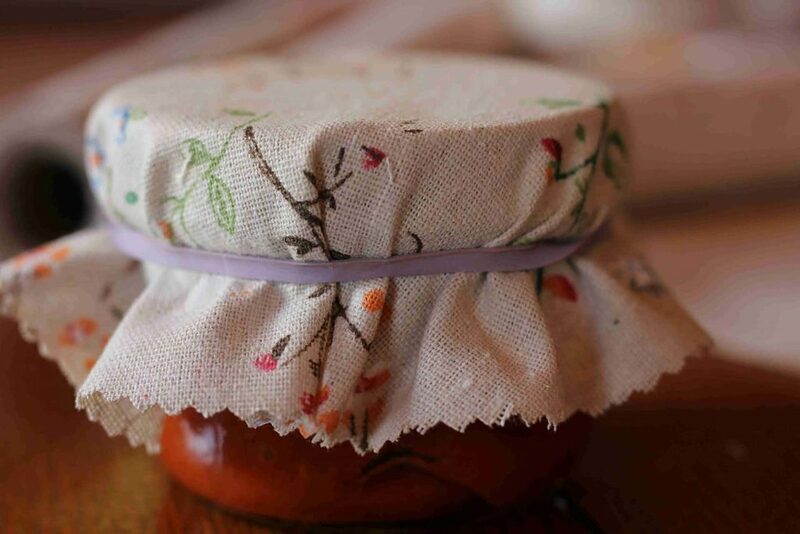 center the fabric over the jar lid and smooth it down around the sides with your hand. You want an even overhang. Attach the rubber band. Slide it to the indented area where the lid and jar meet to keep it secure. Adjust the ruffles. 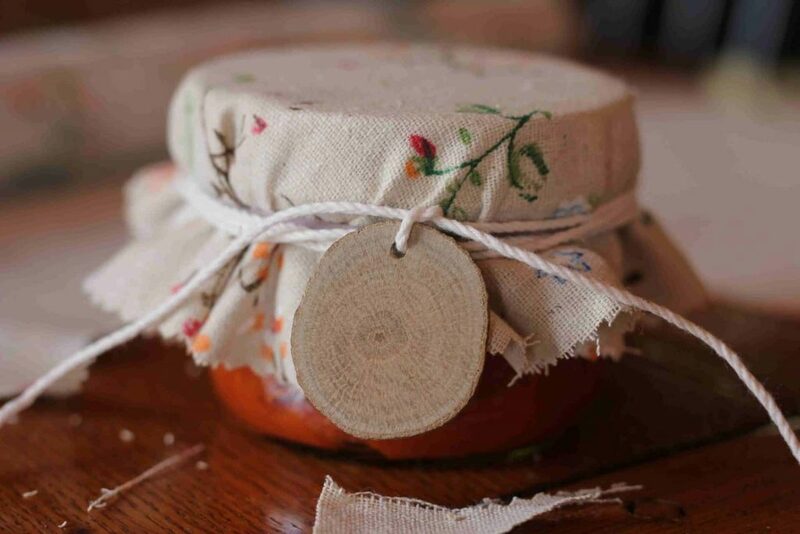 Wrap your ribbon or twine around the jar, keeping it snug. Make sure the rubber band is no longer visible. Leave enough ribbon to tie off or create a bow.